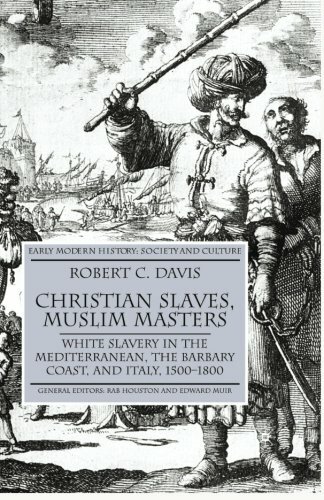 Christian Slaves, Musl... R. Davis Best Price: $26.09 Buy New $31.72 (as of 04:10 EDT - Details) “From bases on the Barbary coast, North Africa, the Barbary pirates raided ships traveling through the Mediterranean and along the northern and western coasts of Africa, plundering their cargo and enslaving the people they captured. From at least 1500, the pirates also conducted raids along seaside towns of Italy, Spain, France, England, the Netherlands and as far away as Iceland, capturing men, women and children. On some occasions, settlements such as Baltimore, Ireland were abandoned following the raid, only being resettled many years later. Between 1609 and 1616, England alone had 466 merchant ships lost to Barbary pirates. March 7, 2004When Europeans Were Slaves: Research Suggests White Slavery Was Much More Common Than Previously BelievedCOLUMBUS, Ohio – A new study suggests that a million or more European Christians were enslaved by Muslims in North Africa between 1530 and 1780 – a far greater number than had ever been estimated before.In a new book, Robert Davis, professor of history at Ohio State University, developed a unique methodology to calculate the number of white Christians who were enslaved along Africa’s Barbary Coast, arriving at much higher slave population estimates than any previous studies had found.Most other accounts of slavery along the Barbary coast didn’t try to estimate the number of slaves, or only looked at the number of slaves in particular cities, Davis said. Most previously estimated slave counts have thus tended to be in the thousands, or at most in the tens of thousands. Davis, by contrast, has calculated that between 1 million and 1.25 million European Christians were captured and forced to work in North Africa from the 16th to 18th centuries. 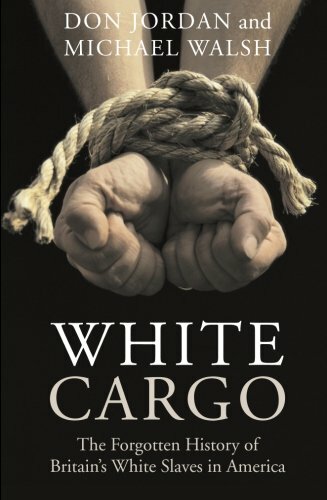 White Cargo: The Forgo... Don Jordan, Michael Walsh Best Price: $12.18 Buy New $24.98 (as of 01:15 EDT - Details) See Also: White Cargo by Don Jordan and Michael Walsh, New York University Press, 2007. 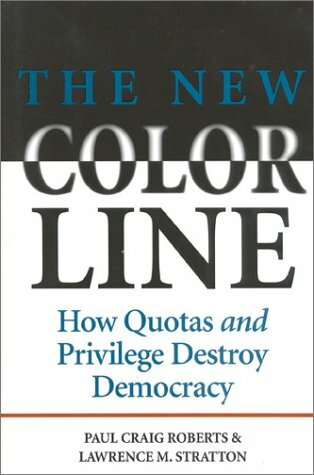 The New Color Line by Paul Craig Roberts and Lawrence Stratton points out that the 1964 Civil Rights Act explicitly prohibited racial quotas. Despite the statutory prohibition, Alfred W. Blumrosen, compliance chief and de facto head of the Equal Employment Opportunity Commission (EEOC) imposed quotas on his bet that the EEOC’s “interpretation” of the law would be upheld by the federal courts out of deference to the regulatory commission. Blumrosen won his bet, and the Civil Rights Act was stood on its head. Blumrosen’s imposition of racial quotas is a perfect example of how regulators, not legislators, write our laws.